Ted Rubinstein is back this week on TDA for Part One of a series to share some of his recent research into connections he’s run across that seem to link link certain suspicious U.S. Intelligence operatives, Radical-Right-Wing factions in California~figures familiar to listeners of this show~a few organized crime figures associated with the CIA/Mafia Castro Assassination plots, a little-known document called “The Kassab Report”, and the Murders of John and Robert Kennedy. Pay close attention, Guys & Gals, this one is fast-paced! This week, Dr. Jeffery Caufield (“General Walker And The Murder Of President Kennedy: Extensive New Evidence For A Radical-Right Conspiracy”) is back to continue our study of former FBI-man, Radical Right anti-segregationist, Commie Hunter, and New Orleans Patsy manipulator Guy Banister. 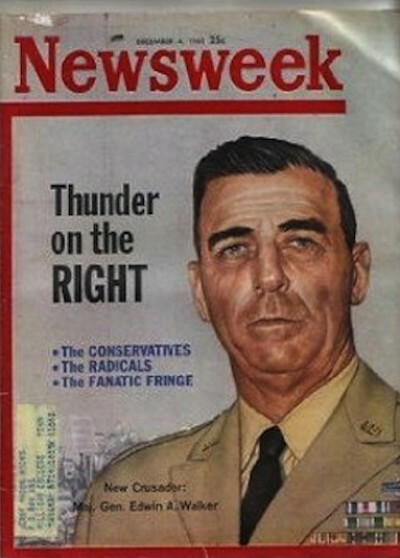 From his connections to organizations like the John Birch Society, The Minutemen, the L.U.A.A.C., and A.C.L.C., his infiltrations of leftist groups, his connections to Walker, Gale, Milteer and others, to evidence presented in Dr. Caufield’s book as to how and why he manipulated Our Favorite Patsy in New Orleans during that fateful summer of ’63. We’ll touch on it all. To listen CLICK HERE! Or search for The Lone Gunman Podcast on Spreaker, Stitcher, TuneIn Radio, iTunes, ACast, Satchel, Blubrry, or Tangent Bound Network and subscribe! This week, Carmine Savastano drops by to discuss the Walker incident and what exactly the docs tell us about it. 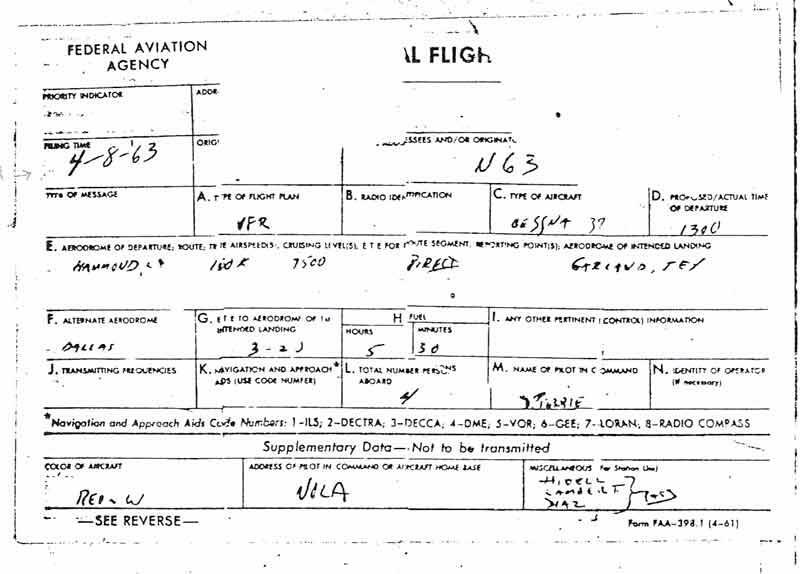 Above is the David Ferrie flight plan discussed, check out the date, destination, and passenger list! Document 1: FBI Document that offers the German Press was told by Edwin Walker the rumor Oswald shot at him before the Secret Service took the Walker Note to the FBI Dallas Office. Document 2: A telegram to the Secretary of State by his Undersecretary that the German Press is very accurate and quick in its reporting of the Kennedy case shortly following the Walker rumor. Document 3: Commission Executive Session and they discuss the “mashed” bullet and the failure of the FBI to identify it. Document 5 and 6: The Walker Letter, no prints from Lee and Marina, unidentified prints, no specifics in letter, no location, no mention of Walker. and Marina was the first person to assert Oswald fired at Walker and connect the note. Document 7 and 8: Walker witness statements, both saw two men, before and after the attack, neither described Oswald. THE DALLAS ACTION~PT.74: “The Strange & Terrible Saga Of W. Guy Banister, Pt.1”, With Dr. Jeffery Caufield. This week, Dr. Jeffery Caufield, author of the new book “General Walker And The Murder Of President Kennedy: Extensive New Evidence For A Radical-Right Conspiracy” is back on The Dallas Action. This is a fascinating, fast paced conversation on The man who manipulated our favorite patsy, Lee Harvey Oswald, in New Orleans. From his early days in the FBI, his checkered career in law enforcement, his personal anti-Communist crusade, and his ties to~and his work on behalf of~some of the the most deplorable, violent, and dangerous Radical Right-Wing racist/pro-segregationist forces in America. From the John Birch Society to the Minutemen, Banister was there. And Banister was a Believer.